Whether you want to participate in yoga, have a massage, or try energy healing, remember it is your decision. Everyone is different and you must decide for yourself. For your information, we are providing few unique, ancient yoga poses that help in keeping your body healthy. Mind it, these yoga poses are not taught in most of the yoga classes - it is an ancient art known to great yoga masters. 'Garuda' means eagle and 'asana' means pose. Garuda known as king birds also happen to be the vehicle of Vishnu. Even though most of the yoga poses aims towards balance and tranquility, by the look of the asana it will be more visible. This asana would help in loosening up your joints. Stretching your muscles would help in making all the parts of your body more fit. The benefit which you can get from this asana is the strengthening and stretching of you ankles and calves. These areas which may be neglected would be treated well by this asana. The stretch would help your thighs, hips, shoulders and upper back. The pull which is created in this asana would help making you more relaxed. So when you are relaxed the level of concentration also improves as you are also keeping a check on your breathing while doing this exercise. There is balance all over your mind body and soul which keeps you always in check for the better things in life. The name given to every asana derives its inspiration from nature. 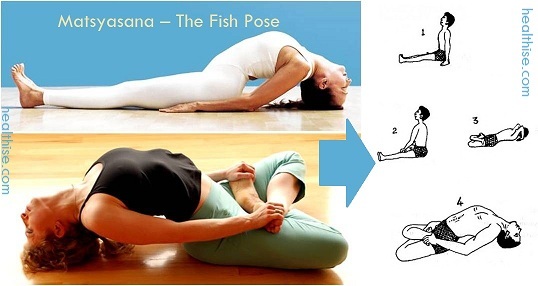 As this pose happens to look like a fish it is known as matsyasna - fish pose. The popular feeling is that Matsyasana is known as the destroyer of many diseases. This asana has to be done in padmasana which may not be that easy for beginner. To make it easy you can do this by stretching your legs and then lie on your back. Knees bent and hands by your side. It is one of the back bend poses which done in correct manner would be very fruitful and useful for you. For many who are doing this for the first time can use support for your neck to avoid any strain. The use of a thick blanket may just be the thing you may need. Do this asana on a blanket to avoid any damage to your back. It can be made difficult with many variations depending upon the person who is doing it. While doing this asana hold it for 15 to 30 seconds to get the full benefit. Pressure and stretch on the neck also helps the thyroid glands including the pineal and adrenal glands. The nervous system, kidneys, stomach, intestines, the pelvic organs are strengthened and toned due to this asana. Asthma patient’s health will improve by this asana. It also helps in improving your posture. It is very useful for constipation, mild headache, fatigue and menstrual pain. This is one of the basic yoga asanas which we learn initially while learning yoga. 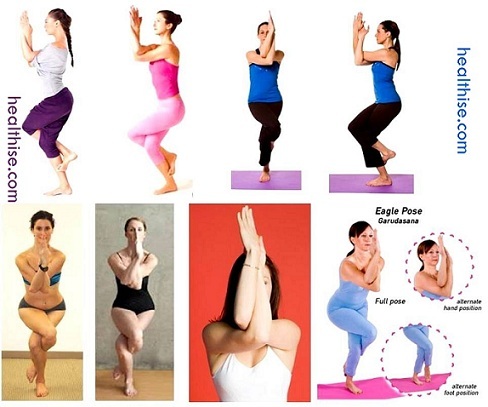 All the yoga poses help in improving your flexibility which becomes very useful in our daily life. The asana is also known as head to foot pose. Your desire to regulate your blood pressure can be done by this asana. The pressure on your head and the stretching of the muscles relaxes your brain, making you work out things more easily and calmly. The stretching and pulling tones your body and relaxes you by making you feel at ease. The bending helps your abdominal organs as it massages the liver and spleen making it useful to the optimum level. If done properly this asana would benefit not only body but would teach you be calm and patient. It has to be done slowly and not in a haste, if you want to receive its full benefits. The tiring muscles would be elevated and rejuvenated by this pose. The stretching of the muscles helps your hips, thighs, hamstrings, groin and calves. When these muscles are stretched they make your body more agile and fit. It helps to strengthen the other muscles which would help in recuperating your tired body. The less stress you give to your important organs it would work in a better fashion and helping your health. With the improper diet, many of us suffer from gastric and indigestion problems. As we do not take care of our health and does not even look at the warning signs our body sends to us. This exercise helps in removing the bloating feeling caused by the indigestion and gastric troubles. It stretches most parts of your body like back, spine and legs which also plays a major role at the time of conception. Your knees are strengthened; the pressure helps in reduction of flat foot. Some other benefits are in strengthening your prostrate gland, reduction in blood pressure, helps in removing your backache, less menstrual discomfort is also provided by this asana. Good article. Sorry for being off topic. Honestly asking, why do girls wear yoga pants? Is it to attract attention or because it’s genuinely comfortable? I’m asking because every girl I see no matter where I go wears them and these pants show EVERYTHING! As I said it’s bad enough that they show ‘everything’ but when they’re being worn by a freaking fat girls, I find it funny lolz. Let me share here some more benefits of Yoga, from Mental Health …. 1….Yoga benefits anyone’s mental health by helping him or her relax, and it is an effective form of psychological therapy. Yoga reduces anxiety and stress, resulting in better health, better mood, and better concentration throughout the day. Yoga has been used to help treat a wide variety of emotional and mental disorders, including acute anxiety, depression, and mood swings….. 2….Even children can benefit from yoga. Those with attention deficit disorder and hyperactivity can learn to relax and get control by using yoga breathing and yoga asanas. ….. 3…Because yoga is a form of meditation, it results in a sense of inner peace and purpose, which has far-reaching health benefits. …… 4…….Yoga has been used to help heal victims of torture or other trauma. I m intrigued how was yoga formed so do I feel you people too … it is mind blowing when we consider benefits and this response I have for you. Where did Yoga originally? … The simple answer is India. Rishis of India made it known to the world learning from the seers of himalayas in India. Well friends, i think & i would suggest you not to do yoga during periods, how can one concerntrate during periods, when she will have a wet bottom all the time, & then there will be a lot of disturbance there with the sanitary napkin & the pantie. However I would suggest to relieve pain it is better to do simple yoga as informed in the article.